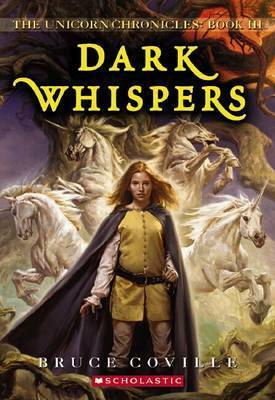 This is a tale of two quests: Cara Diana Hunter's search for an ancient story that may unravel the secret of the long enmity between the unicorns and the delvers, and her father's journey to free Cara's mother from the Rainbow Prison. Cara's journey leads her through the strange underground world of the delvers to the court of the centaur king, while her father must travel from mysterious India to the depths of the Rainbow Prison itself. Bruce Coville has received over a dozen Children's Choice Awards, and has written more than ninety popular books for young people, including MY TEACHER IS AN ALIEN, INTO THE LAND OF THE UNICORNS, SONG OF THE WANDERER, and THE MONSTER'S RING. His most recent novel, DARK WHISPERS, is the third book in his beloved Unicorn Chronicles series. He lives in Syracuse, New York, with his wife, Katherine.